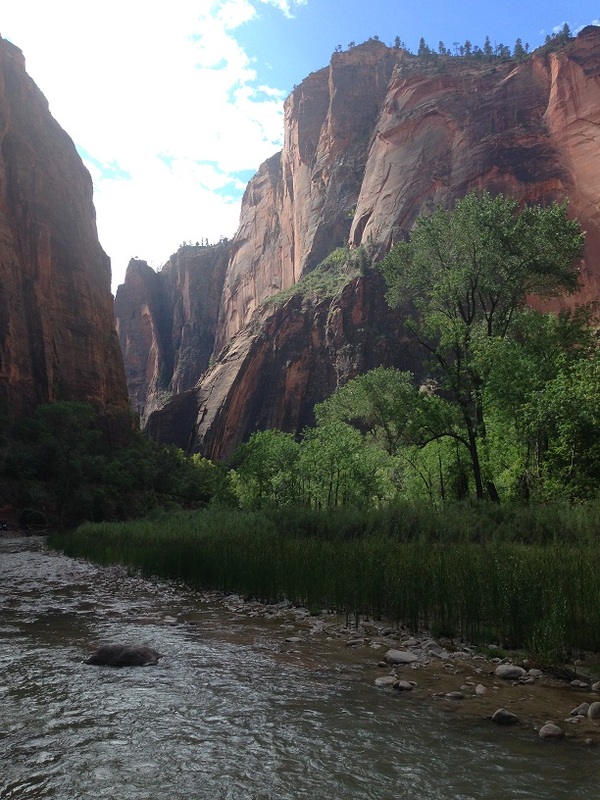 I was a bit leery of Zion National Park, because it was the 5th most visited US national park in 2016 and I have more than a touch of enochliophobia (fear of crowds -yes, I had to look it up). 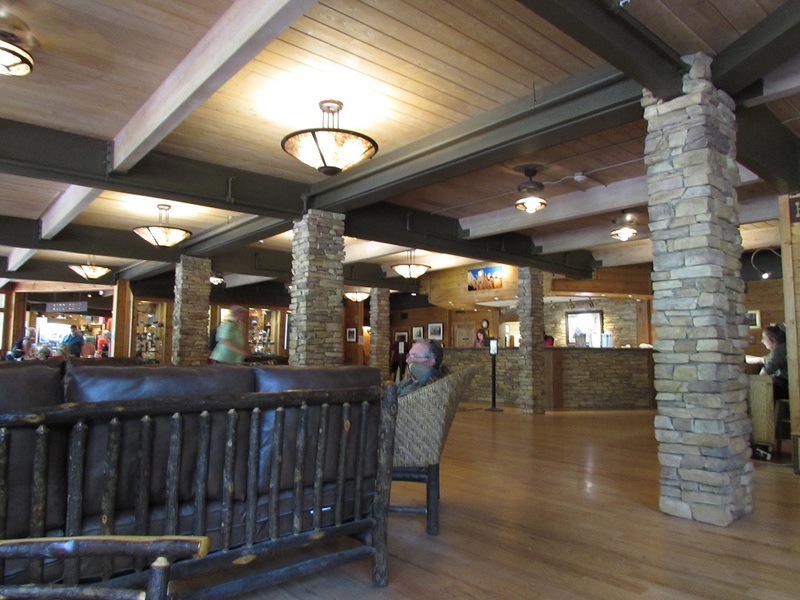 Visitors are not allowed to drive in the park beyond the visitor center (unless they are staying at the lodge) but must ride a shuttle bus to get to various places in the park. I don’t like crowds and Mr. History Tourist doesn’t like shuttle buses. It wasn’t looking good for Zion. We drove from Tropic and got to Zion about mid-morning. Having read that parking in the park would not be available after about 9 am, we were surprised, but happy, to find that it was. We parked at the visitor center, looked at the exhibits and gift shop, then headed for the shuttle. 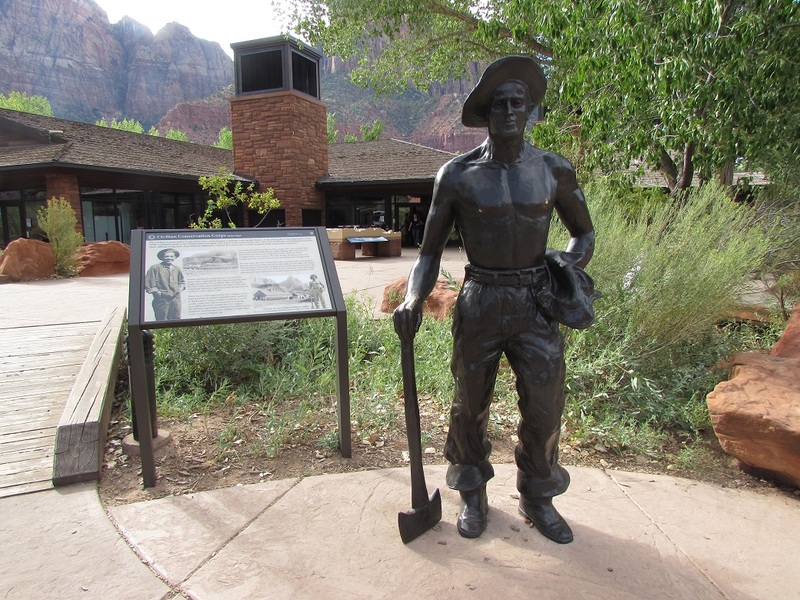 There was a statue of a Civilian Conservation Corps worker outside the visitor center. The CCC was a federal agency that employed young men (about 3 million during its existence) to work on public land projects during the Great Depression. 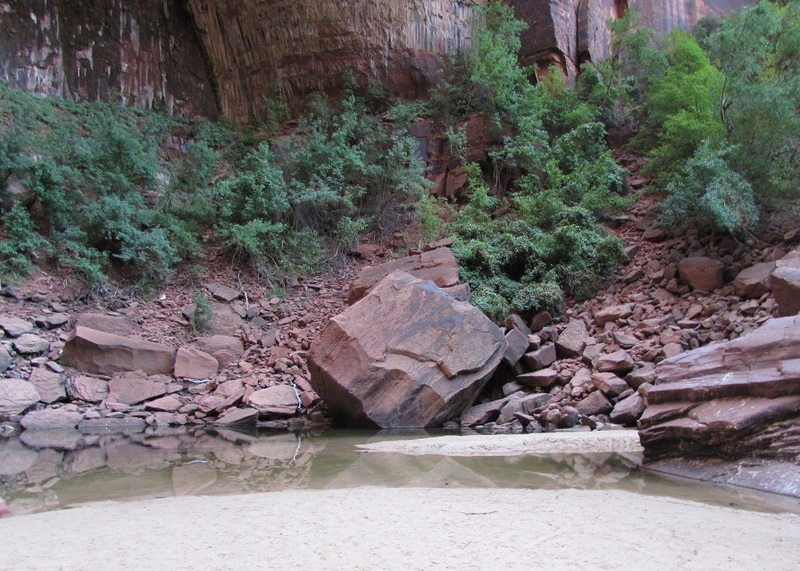 They spent nine years at Zion, building trails, roads, campgrounds and other structures and infrastructure. Their beautiful stonework is visible at many national parks and they are, as far as I’m concerned, the unsung heroes of the national park system. So it’s nice to see them get some recognition. We took the shuttle to the northern-most end of the shuttle route, to the Temple of Sinawava. An interesting article about Zion place names says that the area was named in honor of the Paiute coyote spirit Sinawava. 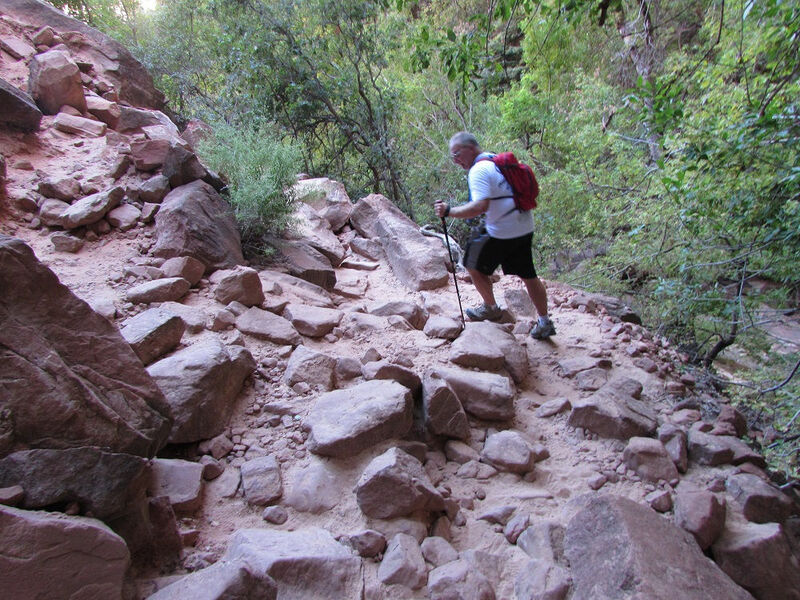 The Temple of Sinawava stop was the start of an easy, paved, 2 mile out-and-back trail along the Virgin River. We just did the paved trail, but the more adventurous went on, at the end of the paved trail, to cross the river to do the “strenuous” Narrows hike. 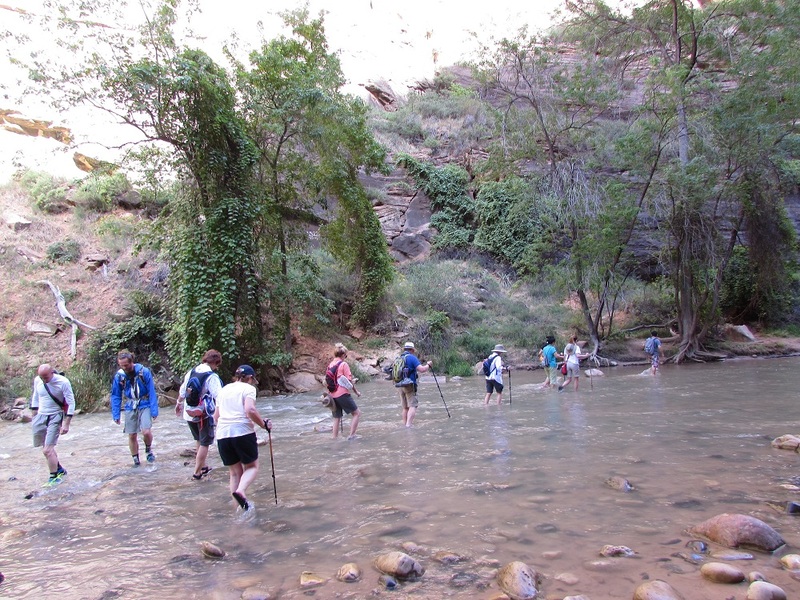 The Narrows is a 9 mile hike along, and sometimes in, the river as the passes through the canyon. 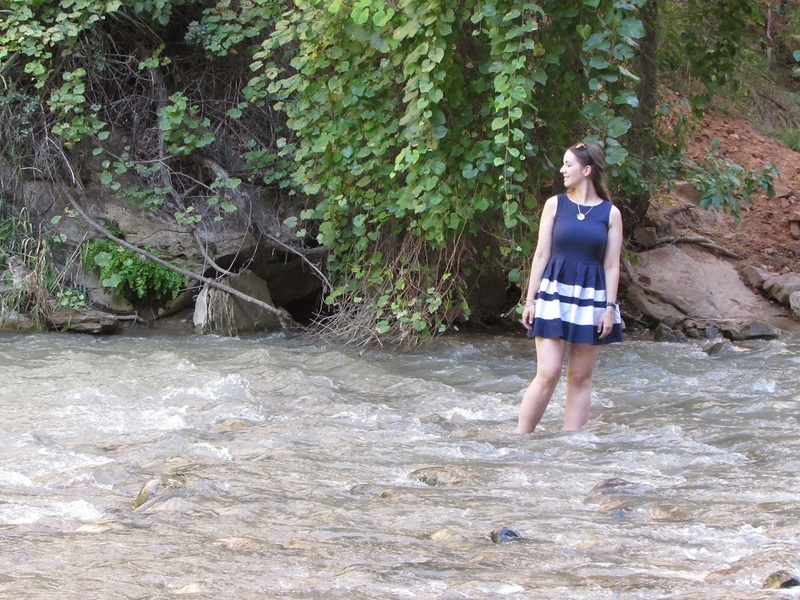 I was amused by this young woman, who posed in the middle of the river in a dress. She was there for several minutes, turning this way and that, like a model at a photo shoot, while her boyfriend took the photos from shore. … before moving on to the Grotto Trail. It’s an easy, 1 mile that goes from the Lodge, via a trail cut into the side of the mountain, to a shallow overhang. 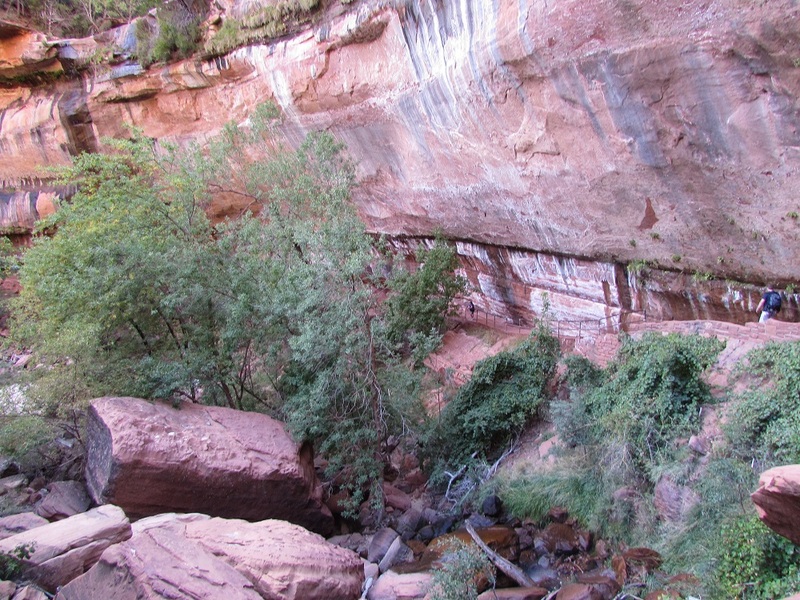 The Grotto connected with trails that went to the Emerald Pools, three natural ponds at successively higher elevations. The park pamphlet said that it was an easy hike to the lowest Emerald Pond, so we decided to go on. I was feeling good as we connected to the Upper Emerald Pool trails about a mile later, so we continued. That’s where it got a little hairy. It was a rocky path, with some stairs, some scrambling and lots of steep, to the uppermost Emerald Pond. But it was fun and not too strenuous (the NPS rates it “moderate). Do it for the hike because the Emerald Pools aren’t all that (at least not in early September). 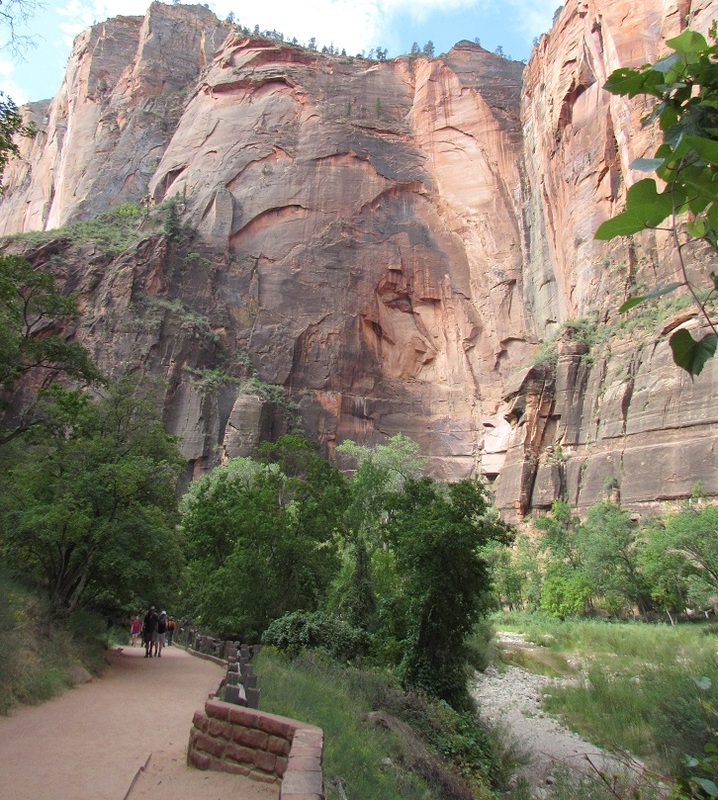 We did not do Zion’s most popular hike, to Angel’s Landing, because my chemo-induced neuropathy makes me a little wobbly and there are some narrow drop offs along the path. We also didn’t visit Zion’s Museum of Human History, because we ran out of time. We’ll do both the next time, though. We were told by an elderly couple who were just returning from Angel’s Landing that it’s entirely doable by the average hiker. Their one piece of advice was to go as early as possible. Apparently the crowd is all on that trail. Gallery | This entry was posted in Utah and tagged Civilian Conservation Corps. Bookmark the permalink. I would recommend it highly. It’s unbelievably beautiful.